Anyone here with a detolf? Re: Anyone here with a detolf? The detolf itself costs £40. You then need some strips of wood and some 1cm square mesh to make a lid (you can get them cut to the size you want at the diy store). Maybe £10. If you wanted to stand it on two of these kallax units (it fits with a gap between them so both ends of the detolf are supported), they are £20 each, so another £40. Then you need to allow £10 to £20 for a wheel, £7 to £10 for a house, and maybe another £25 for toys and cage contents, plus substrate. The bits and pieces and extras can all add up, but you can make a lot of toys yourself or use a ceramic mug or toilet roll tube toys. Bendy bridges are a popular choice though. I ended up spending I think £70 total for the whole thing, £40 for the detolf then another £30 for materials. The wood was about £10, it can vary depending on the thickness and the width you get or what's available. I got mine in B&Q but because the wood wasn't very thick they said they couldn't cut all the lengths for me in their machine but I did manage to convince one guy to cut the lengths in half with a handsaw for me so I could fit them in the car! Mesh was quite expensive, I got the 25x13mm stuff also in B&Q which is £7 per sheet and with the dimensions (600x900mm) I needed one for each lid so £14, and then I also spent money on a staple gun and glue. If you plan on using nails and metal connectors those are quite expensive but the result might be neater than mine which looks a bit clumsy with the glue and staples but it's very secure and super easy. Mine is sitting on lack tables which work fine and I much prefer the space underneath for more flexible storage than the kallax. I like the height a bit better too, I'm a shorty and the level is just perfect for me to get my hands in easily for cleaning. Obviously there's a lot of tank to fill so finding a bulk bedding that works for you is important, a lot of people use Fitch which is a paper based bedding you can order direct or from Amazon (quick Google will get you sorted, it's easy to find). I use hemp, I used the Hugro stuff from zooplus previously and liked it, you get 100lt for £20 which lasted me maybe 3-4 months? But tbh I don't do full cage cleans and throw out a little bit at a time and sometimes give the inside a wipe with a cloth do I don't go through a lot of bedding, my Syrian is pretty well potty trained when she isn't peeing on her hoard out of spite . I recently bought the hemparade also from zooplus which is 150lt for £16 I think, it's compacted so easier to store and a very similiar, maybe even softer product, for better value. 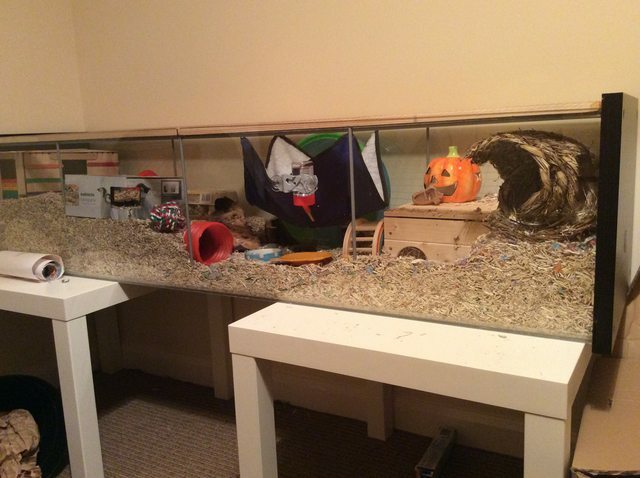 Your hamsters are really lucky to have homes like that! All the big cages look great!